Which 2019 Mini Cooper Is Right for You? Mini Coopers are known for their unique European styling, compact dimensions, and innumerable customizable options. Just to start with, there are 12 different body colors to choose from! And that's before you take into account the various roof and mirror color variations. And racing stripes, and Union Jack paint jobs, and...well, we could go on. Thankfully, the 2019 Mini Cooper only has three trim levels to choose from. Since they share similar dimensions, we'll be discussing the three main models buyers can choose from: the Mini Hardtop 2 Door, the Mini Convertible, and the Mini Hardtop 4 Door. 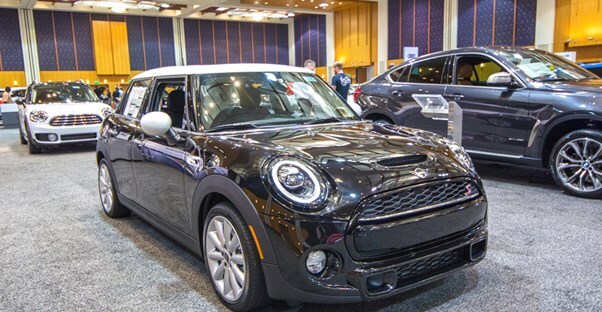 The 2019 Mini Hardtop 2 Door is the classic coupe design with big bulging-eye headlights and large smiling grille. It's this cute design that has owners so enamored with their purchases. At an MSRP of $21,900, buyers have the choice between 4 body color options. Racing stripes and Union Jack mirror caps are optional add-ons. Standard features include a media system with 6-inch display, rear camera with parking sensors, and the unique Mini center console featuring a circle design. A 6-speed manual transmission is standard, but buyers can upgrade to an automatic for $1,250 more. Additional interior standard features include a leather-wrapped 3-spoke steering wheel and carbon black Sensatec upholstery on the standard seats. Lastly, this Mini Cooper rides atop 15-inch alloy wheels. The Mini Convertible Classic, a drop-top version of the two-door coupe, is available with the same features for a $27,400 starting price. Additionally, a Mini Hardtop 4 Door Classic model, sporting all the same features, is available starting at $23,400. The Mini Cooper's mid-level trim is the Signature. This trims adds seven additional body color options, bringing the total array of choices to a whopping eleven. Besides the car body color, the roof and mirror cap colors can be customized to your liking. They can match your body color or be patined black or white. The interior sees a major upgrade from the Mini Cooper Classic trim. A panorama roof, heated seats, and dual-zone automatic climate control all come standard at this price point. Buyers will also appreciate the Comfort Access keyless entry. Even the wheels have an upgrade to a 16-inch alloy set. The 2019 Mini Hardtop 2 Door Signature starts at $24,900. It's Convertible Signature counterpart will set buyers back $29,900 before add-ons. The 2019 Hardtop 4 Door Signature starts at $25,900. All models have the same trim features. Finally, the top of the line Mini Cooper trend is the Iconic. The Iconic also has an additional body color choice bringing the total number of options to twelve! It's definitely the most of any car model we can think of. Standard features of this trim level include premium leather upholstery and Connected Navigation Plus with Apply CarPlay capability. On the exterior, the Mini Cooper Iconic sports LED headlights and taillights, as well as 17-inch alloy wheels. For the 2019 Mini Hardtop 2 Door, the starting MSRP is $29,900. The Mini Convertible starts at $34,900. The 2019 Mini Hardtop 4 Door, meanwhile, has a starting MSRP of $30,900. Which Cars Have the Highest Trade In Values?